A young boy enters through the stargate with a warning for the SGC. The boy, Charlie, explains that his home planet, Reetalia, was destroyed by the Goa'uld, and now Reetou rebels plan to destroy all humans to eliminate possible hosts. Further, he adds that he was genetically engineered to deliver his warning because the Reetou are invisible, and that "Mother" is with him. Carter's father, Jacob, now a Tok'ra ambassador, verifies the boy's story, but already Reetou rebels have infiltrated the facility. In a battle for control of the base, the SGC is victorious, but the rebel threat remains. Carter is able to sense naquadah, to detect the presence of a Goa'uld symbiote in a host or a Jaffa. A Goa'uld symbiote in a host or a Jaffa is able to sense the presence of a Reetou. "Mother" had been watching the SGC for many weeks. 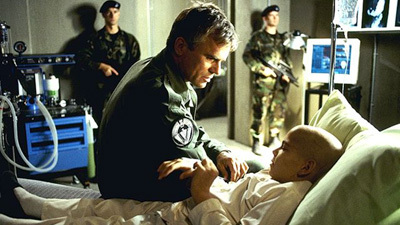 She first saw SG-1 on another planet, and followed the team through the stargate where she observed them until they returned with Tonané, and determined O'Neill could be trusted. Charlie and the Reetou are from Reetalia. Most of the Reetou were destroyed by the Goa'uld. In retalliation, Reetou rebels intend to destroy the Goa'uld through attrition by destroying all possible hosts. They work in small groups of five suicide infiltrators using cross-phasal explosives. The Central Authority of the Reetou oppose the rebel plan, and sent Mother and Charlie to warn Earth. Charlie is human, created through accelerated genetic engineering to act as an intermediary. The acceleration caused several major organs to have congenital defects, including his heart, kidneys and lungs, and his reticular formation is twice normal size, allowing him to perceive the Reetou. According to quantum physics, matter exists in both particles and waves. If the Reetou waves are exactly 180 degrees out of phase with Earth, then their light and sound waves would be undetectable. However, the Reetou are able to operate things in our phase. A Transphase Eradication Rod (TER) relies on the Reetou emissions that Goa'uld are sensitive to, in order to make the Reetou visible in our phase, and to terminate them. SGC can use the Tollan sub-space transmitter to contact the Tok'ra. Several TERs were left with the SGC, and hand scanners were installed to prevent the Reetou from controlling the iris. Charlie was taken by the Tok'ra to be healed by a symbiote.